A record number of Americans carry auto loan debt today, as the collective auto loan balance in the U.S. grew by $8 billion in the last quarter of 2017. Unfortunately, auto loan delinquencies have also been growing. Some 4.1% of auto loans are more than 90 days delinquent, and the delinquency rate has been on the rise since 2012, according to the Federal Reserve Bank of New York. If you’re having a hard time keeping up with your car payments, you might have considered refinancing your auto loan. When you refinance an auto loan, you’re taking out a new loan with a different lender and using it to pay off your existing loan. They want to get a loan with a lower APR, which can help save on the cost of interest. They want to get a loan with a longer loan term, reducing their monthly payment and increasing the length of time they have to repay the loan. They want to get a new loan in order to release a cosigner from their existing loan. Refinancing an auto loan isn’t the best choice for everyone, so you’ll need to carefully consider your current situation and whether a refinance can benefit you. 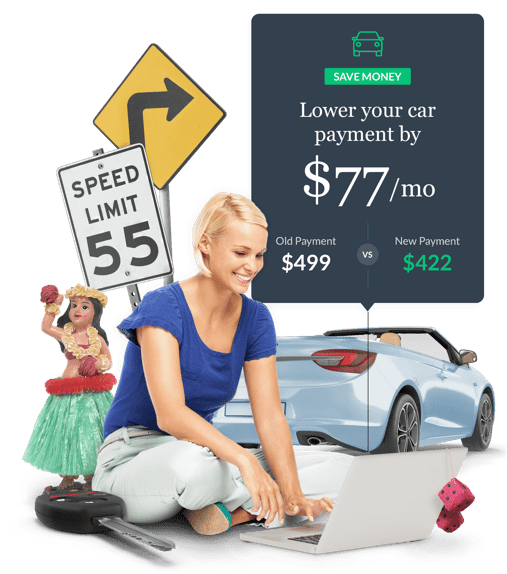 In this post, we’ll not only cover the pros and cons of refinancing but we’ll also tell you some of the best places to shop for a new auto loan. When you refinance an auto loan, it’s essential to choose a lender that will give you the best deal. Otherwise, you might not be saving much at all. Your loan shopping process should start with on strategy: Getting quotes from several different lenders to ensure that you’re getting a great deal. You never want to take the first rate a lender offers you, because there may be better deals out there that you’ve overlooked. Starting with your local bank makes sense for one key reason — because you already do business with them, your bank may offer you a better deal than other lenders. Request a quote from your bank and see what rate they have to offer. In some cases, they may require you to meet some qualifications first, such as holding a savings or checking account with them, or setting up automatic payments and committing to keep a minimum amount in your bank account. Be sure to read the fine print. There’s nothing wrong with trying to negotiate with your current lender on your existing rate. Staying with the same lender if they’re willing to offer you a better rate. As well, they already have your personal information, meaning you don’t have to go through a bunch of paperwork to refinance with a new lender. It’s still a good idea to compare rates with other companies so that you be able to use that as a bargaining chip. If your current lender believes you’re not afraid of taking your business elsewhere, you could in theory be able to negotiate a better rate. Sometimes the best deals can be had online. That’s because there are many companies that may not have local branches in your area but serves customers nationwide. Also, many are internet only companies. By comparing multiple lenders, it’ll help you stay within your budget and save you money over the long haul. If you want to get quotes from several lenders at once, there are tools you can use online to make it super easy. 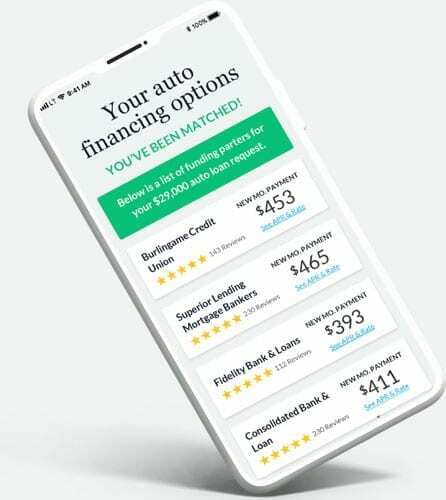 LendingTree’s auto loan refi marketplace is good place to start. You can fill out a short online form and potentially get quotes from lenders right there and then. This makes it easy to compare APRs, monthly payments and your loan term to find the best possible rate possible. Choose the best quote of the bunch and take it to your current lender. If they can’t beat that rate, then you’ll feel secure knowing you’ve found the best deal possible and get ready to make the switch to a new lender. When comparing offers from various auto refinance companies, focus on how much you’ll end up paying throughout the life of the loan.It’s not enough to look at the monthly payment as that’s not the best indicator of the best deal. Sure, an auto refinance company many offer you a low monthly payment, but you may not get the best deal if their interest rate is higher and charges other types of fees. The APR, or Annual Percentage Rate is what it costs you each year to borrow money. This includes the interest rate and any fees you need to pay the lender to give you a refinance. In other words, the APR reflects the total cost to refinance your car. The lower the APR, the less you’ll pay over the duration of the loan. You’ll want to find a company that offers a lower APR than the one you current have to see if you’re getting the best deal. This is the best way to find out the total cost of the loan. It’s not enough to just compare interest rates as this number doesn’t take into consideration the fees a lender will charge. The likelihood of you getting a lower APR is high if you find a company that generally offers lower APRs. You may need to pay fees to the lender so you can refinance your loan. These fees can include state registration fees, vehicle title fees, and document preparation fees. Fees set by your local or state government are non-negotiable, but ones set by the lender can potentially be negotiated. When comparing lenders, you’ll want to find one that charges the least amount of fees, as these can add to the overall cost of your loan. If you find a lender that offers a low interest rate but has high fees, it may not make sense to refinance with them. Some lenders may charge origination fees. This is something lenders may charge you for providing you a loan. Think of it like a processing fee, where you’re paying the lender to process paperwork, such as verifying the information on your application form. An origination can either be quoted as a flat fee or a percentage of your total loan. For example, if your lender charges you 2% of a $8,000 loan, your origination fee will be $160. Keep in mind, your origination fee will be factored into your APR, which is why it’s important to pay attention to your APR vs your interest rate alone. You want to see if a lender offers reasonable minimum and maximum loan balances. This is important to know because it could affect whether or not you can refinance your entire loan. Or it could be that a lender doesn’t have a minimum requirement per se, but will only offer you a certain APR if you borrow a certain amount. For example, you still owe $4,500 in your car and a lender has a minimum loan requirement of $5,000, you can’t go with that company no matter how great their rates are. Some lenders may also set a cap on the vehicle’s value or its condition. For example, major lenders will look at how old your car is when deciding a rate, or even if you can qualify for a auto loan refinance. Some lenders don’t give out loans if you’re currently “upside down” on your loan, when the value of our car is lower than what you currently owe. If this is the case, you’ll want to find a lender that is willing to refinance more than the value of your car. It’s important to ask any prospective lender what the minimum or maximum loan amounts so you know which places to bother applying for. The best companies will offer a variety of loan repayment terms. This can help you either pay off the loan more quickly or give you some breathing room in your budget, depending in what our needs are. If you’re looking to save as much money as you can, you could refinance your current loan for a shorter term. If a lender provides shorter repayment terms, you can save interest over the duration of your loan, even if your monthly payments remain the same.If you decide you want more breathing room, extending the term could lower your payments. You may pay more interest in the long run, but if you can find a company with a lower APR, you can still save money overall. Finding a reputable company is crucial because you don’t want to be caught in a tough situation. If a lender isn’t truthful, you could find yourself paying more than you bargained for with your auto refinance. A reputable company will make sure to explain exactly what you’re getting into, including how much interest (or applicable fees) you’ll need to pay, and what happens if you fall behind on your payments.The Truth in Lending Act states that lenders need to give you a written disclosure of all important terms of your loan agreement. A reputable lender will take the time to walk you through the document, including how you owe, any fees at the end of your loan term, as well as disclose the amount due when you sign the loan papers. Comparing lenders is important as it’ll help you see which one is more willing to help you figure out that it is that you’re getting into. A reputable company shouldn’t have conflicting terms and conditions. In other words, their fine print doesn’t contradict their big print. It’s also a good idea to ask as many questions as you need to in order to gain clarity on loan terms. If a lender isn’t willing to answer your questions, it could be a sign they’re not the best one for you. Be wary of companies that try to pressure you into a signing for a loan or any extra products such as credit insurance. Remember, once you sign your name on the dotted line, you’re legally obligated to follow the terms of the loan. If you can get approved for a lower interest rate with better terms, it could help you save a significant amount of money. For example, you were stuck with a high-interest loan because your credit was mediocre before. If your credit score has improved, you may be able to find a better deal now. And if you keep the same repayment term, you could find yourself paying a lot less interest throughout your loan. Refinancing for a longer term can help you lower your monthly payment, freeing up much needed cash for other things. The downside is that you’ll pay more in interest over time by dragging out your payments. For that reason, try to negotiate a lower APR if you can. You can also use an auto loan refi to release a cosigner from the loan. Before going off and applying for a loan, ask yourself the following questions to decide if refinancing is right for you. The lower your credit score, the less likely you’ll be approved for a loan with lower rates. However, if your credit score is higher than it was when you took out the original loan, you could refinance for better loan terms. Otherwise, it may make sense to keep making loan payments on time to help improve your credit score. Get a free credit score estimate at My LendingTree. How soon do I want to pay off my car? The longer the term on your car loan, the more you’ll pay in interest. If you can afford to do so and really want to pay off your loan, a refinance makes sense. You can consider refinancing for a shorter term to pay off your car sooner. Has my financial situation changed? Refinancing can lower your payments, giving you some extra cash if you find that you’re making less than before. If you make more money since you got your original loan, you can refinance for a shorter term so you can pay off your loan sooner and save money in interest. Will it cost me more money to refinance? Your current lender may make you pay a prepayment penalty when you refinance. If the penalty is more than what you could be saving with a refinance, it’s probably not worth it. Lenders have requirements on the types of cars they’ll refinance. For examples, companies won’t refinance cars that are older, have a lot of miles or even certain makes of vehicles. Your options may also be limited the older your car is. Will my current loan quality? Auto refinance companies may have minimum loan requirements. If you don’t owe enough to make that minimum, you can’t qualify for a loan. As well, if you only have a few payments left, it may not make sense to refinance a loan as you may not be saving as much as you’d thought. If interest rates in general have gone down since you took out your original loan, it could be worth considering. Even a drop of a few percentage points can reap significant benefits over the duration of your loan. Just because interest rates may have dropped, doesn’t mean you’ll qualify for lower rates. If your credit score has improved or your DTI (debt-to-income) ratio has decreased, you could be able to get better terms on a refinance. If you had to settle for a less than favorable APR or interest rate, it might still be worth looking around even if your financial situation hasn’t changed. For example, the local car dealer bumped up their rates and you didn’t find out until you signed the loan papers. Rather than risking defaulting on your loan, it’s better to renegotiate the repayment terms on your current loan. Your monthly payments could be less, giving you some breathing room. Finding a lower rate is great as it could lower your monthly payments, even if you have the same repayment period. Many lenders will not refinance an auto loan if your car is too old. For example, some lenders won’t even look at your loan application if your car is older than 10 years old or have more than 80,000 miles on it. Unfortunately, you may be stuck with your current loan if that’s the case. The longer you wait to refinance your loan, the less likely you’ll be able to save on interest. That’s because you pay off more interest at the beginning of your loan. By the end of your loan, you’re mostly paying interest, meaning you may not save that much in interest if you refinance your loan, if at all. Yes, you may be saving on interest, but the fees associated with a refinance may cost more. Your current loan may have penalties for paying off your original loan earlier with your refinance. For example, some lenders may charge a flat fee or add on extra interest. There’s also fee such as lien holder and other state fees. While individually they may not be a lot, all of this could add up. It’s a good idea to calculate how much you’ll save in interest and compare it to any prepayment penalties to see if it’s worth it to refinance.